Will our refuge system stay true to its purpose? 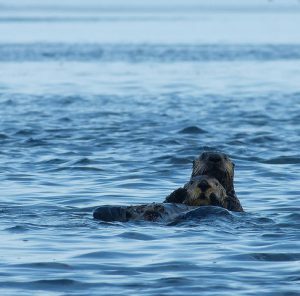 Sea otters in Izembek Lagoon. Photo by USFWS, Kristine Sowl. In May, our summer interns, Maggie and Jenna, jumped into legal research and writing—not to mention Alaska’s wild. During her time here, Jenna Lewis worked on issues related to public lands and wilderness. Here, she writes about a proposed land exchange and road in Izembek National Wildlife Refuge that puts all public lands in peril. The fight for Izembek is a fight for a Refuge System that stays true to its purpose. This summer at Trustees, I worked on a legal challenge to a land exchange agreement that would allow the construction of a road through Izembek National Wildlife Refuge, one of Alaska’s remarkable wild places and public lands. Izembek wetlands sustain many animals, including birds that migrate around the world. USFWS, Kristine Sowl. At 315,000 acres, Izembek is the smallest of Alaska’s sixteen national wildlife refuges. Despite its relatively small size, this refuge on the southern tip of the Alaska Peninsula has huge ecological importance. One of the key purposes of the Refuge System is to conserve fish, wildlife, and fish and wildlife habitat. Designated as a Refuge by the 1980 Alaska National Interest Lands Conservation Act (ANILCA), Izembek is particularly situated to do just that. Nearly the entire Refuge—300,000 acres—is a congressionally-designated Wilderness area that provides habitat to brown bears, fox, caribou and many other animals. Izembek was also the first U.S. area recognized as a Wetland of International Importance under the Ramsar Convention in 1986. The entire Pacific population of black brant rely on Izembek’s eelgrass. Photo by Kristine Sowl, USFWS. 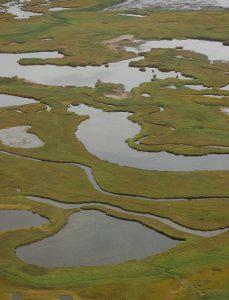 The ecological heart of Izembek is the narrow isthmus that separates the Izembek and Kinzarof lagoons. These lagoons contain some of the largest eelgrass beds in the world, attracting waterfowl and other birds, and supporting fish and marine mammals, including the threatened northern sea otter. 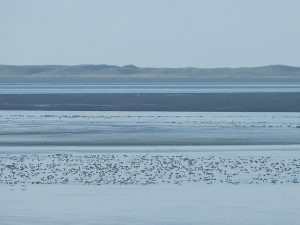 The isthmus separating the lagoons serves as a vital stopover for many migratory bird species, including almost all of the world’s population of Pacific black brant, over half of all emperor geese, and a large population of threatened Steller’s eiders. Despite its pristine qualities and undeniable importance to wildlife, Department of the Interior Secretary Zinke signed a land exchange agreement with King Cove Corporation in January 2018 that would give away Izembek Refuge lands on the isthmus and put them into private corporation ownership. The purpose of the land exchange is to build a road that connects King Cove and Cold Bay. 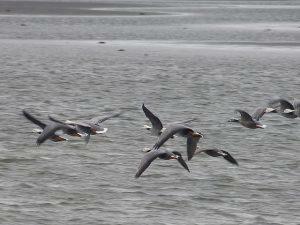 Emperor geese in Izembek. USFWS, Kristine Sowl. Zinke entered the agreement without regard to numerous environmental laws, such as ANILCA, the National Environmental Policy Act, the Endangered Species Act, and the Wilderness Act. The road’s impacts are difficult to quantify, but they are certain to be detrimental. In fact, after a four-year environmental analysis on a similar proposal, the U.S. Fish and Wildlife Service determined in 2013 that a road through Izembek would unjustifiably jeopardize the vital ecology of the region. The lands to be acquired in the proposed exchange are adjacent to the refuge and worth protecting, but no lands can adequately substitute for those that DOI wants to trade away for a road in an unlawful agreement that threatens the health of this refuge. 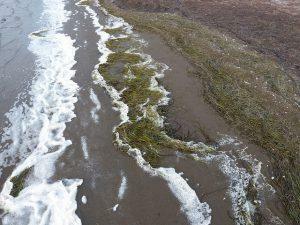 Eelgrass on the beach. USFWS, Kristine Sowl. A land exchange and road would undermine the purpose of the Refuge System and signify a devastating shift in national priorities and a profound weakness in our public lands protections. If the most significant portions of Izembek—a national wildlife refuge, designated Wilderness area, internationally recognized wetland, and vital bird habitat—can be traded away without any public or environmental review, how can we protect public lands at all? Unfortunately, the proposed land exchange is just one example of the ongoing assault on public lands in the United States.